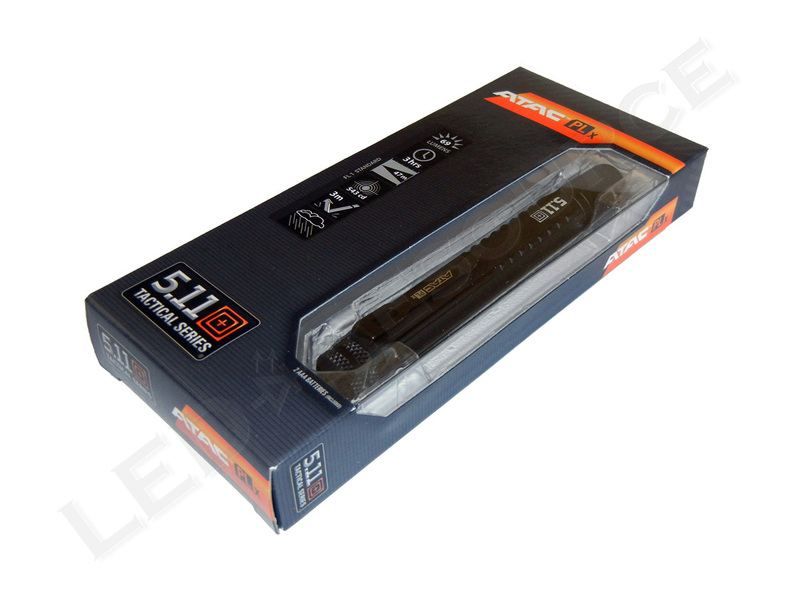 FL1 Standard – these specifications can be found on the packaging of most flashlights today. What do these specifications mean for you, and how can you interpret this information? 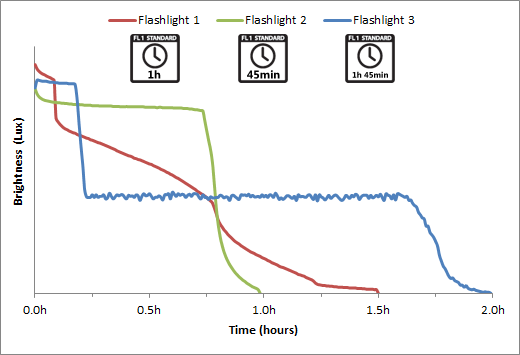 Since we started including runtime graphs in our reviews, we’ve gotten a lot of questions about the ANSI FL1 Standard, so this article is intended to give you a better understanding of the technical aspects of flashlight performance. ANSI/NEMA FL 1-2009 Standard – Details about the FL1 Standard. Interpreting the FL1 Standard – Decoding the technical description. Limitations of the FL1 Standard – Shortcomings of the FL1 Standard. LED-Resource Abbreviations – List of abbreviations used in our runtime graphs. “3W LED” was a common term used when high performance LEDs, such as the Luxeon, were first introduced. LEDs have varying efficiencies and rarely operate at the rated power, so this doesn’t really have any meaning. “1 million candlepower” (or any other multiple of a million), is often seen on lanterns and spotlights. A million of anything is impressive, but how bright is one million candles? “High-flux LED” is really just a fancy way to say that the LED is bright, but even if you’re an engineer, it still doesn’t have much meaning to it. Light output is a measurement of luminous flux using an integrating sphere. The unit of luminous flux, lumen, is a measurement of energy. Peak beam intensity is a measurement of luminous intensity at the middle of the flashlight beam. The unit of luminous intensity, candela, is a measurement of energy. Beam distance is defined as the distance from the flashlight where illuminance is equivalent to a full moon on a clear night. Runtime is defined as the amount of time, rounded to the nearest quarter hour, until output drops below 10%. Now that we have defined these ratings, let’s see what the not-so-obvious ratings mean. Light output is determined by the total amount of light coming out-the-front (OTF) of the flashlight and is related to the LED’s efficiency and how much power it uses. Peak beam intensity represents brightness as perceived by the human eye and is related to how the beam is focused by the optical system (typically a reflector, lens, or optic). So, which is more important? Light output can be thought of as “raw material,” but it’s how that light is dispersed that determines usefulness. For example, a fluorescent lamp has high output but low intensity (a dispersed, or flood, beam), whereas a laser and has low output but high intensity (a focused, or spot, beam). Both are useful for their intended purposes, but neither would make a good flashlight. 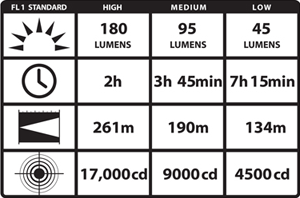 Thus, the candela per lumen (cd/lm) ratio can be used to determine if a flashlight has a spot- or flood-type beam. Spot beams (large cd/lm ratio) are great for lighting up distant objects, but at close range, the hotspot may be blindingly bright. Flood beams (small cd/lm ratio) are great for close work, but for distant objects, there’s not going to be much light. As a reference, well-focused spot beams can be over 100 cd/lm, tactical flashlights are typically between 20-100 cd/lm, and work lights are less than 10 cd/lm. Keeping this non-linear relationship in mind is important for making Peak Beam Intensity comparisons, and a rough estimate is that for a light to appear twice as bright to the eye, four times the intensity is required. Beam distance is calculated from peak beam intensity, so there is actually no new information here. In addition, a full moon on a clear night is not really a useful amount of light, so don’t put too much weight on this specification. While the FL1 Standard is a big step forward, no standard is free of issues, and there are some limitations to the FL1 Standard. Knowing the limitations of a standard is just as important as knowing what the standard means, and the biggest limitation of the FL1 Standard is the runtime rating. Flashlight 2 has the shortest runtime, but it is consistent and within 10% of the initial brightness. Flashlight 1 has slightly longer runtime than Flashlight 2, but brightness (which is mostly less than 50%) is continuously decreasing. Flashlight 3 has a long runtime that is maintained at 50% brightness. Based on the runtime graph, we can say that flashlight 2 is a better choice than flashlight 1, and flashlight 3 is the good choice for extended runtime (in fact, flashlight 1 and 2 are actually the same flashlight using different batteries, but that’s the topic for another article). These observations would not be possible with just a runtime rating, which is why conduct our own independent ANSI FL1-compliant testing and include runtime graphs in our reviews to supplement the FL1 Standard Runtime. For more information about our runtime tests, please click here. While LEDs are reliable solid-state devices with no moving parts, electronic circuitry that regulates power to the LED tend not to be as durable. Occasional drops shouldn’t be an issue, but repeated stress can cause damage that may lead to erratic operation or failure. Our advice would be to treat LED flashlights like any other electronic device and avoid drops or other damage if possible.